“The consummate cross-examiner.” "One of his key attributes is his ability to, with great wit and charm, metaphorically fix his hands around the throat of an opponent and slowly strangle them." Harry Matovu is a noted advocate, “a consummate cross-examiner, who's great on his feet" and “tremendously tenacious and committed, he's an absolute team player" (Chambers & Partners 2018). He has a wide-ranging commercial practice and considerable experience of general commercial claims, including civil fraud, banking and finance, insurance and reinsurance law, oil and gas and public international law and public inquiries. He has been instructed in a number of very high-profile cases; litigation arising out of an attempted coup against the Government of Equatorial Guinea, which was listed by The Lawyer magazine as one of the top 20 cases for 2006, 2007 and 2008; a successful judicial review challenge to one of the major spending cuts of the Government, which was listed by The Lawyer magazine as one of the top 20 cases for 2011; and a US$1.7 billion dispute over oil exploration rights in Iraqi Kurdistan, which was listed by The Lawyer magazine as one of the top 20 cases for 2012 (Excalibur Ventures LLC v Texas Keystone Inc). His banking and fraud work includes successfully acting in a billion-dollar Kazakh bank fraud claim up to the Court of Appeal; and in a substantial longevity swaps dispute between a Swiss investment fund and a leading global investment bank. He is "strong on cross-border jurisdictional issues" (The Legal 500 2016), and has expertise in AIFMD matters and passporting issues in relation to offshore funds, and also in investment funds and complex financial products. He is presently engaged on a major international energy dispute, which is the largest and most high-profile piece of litigation heard by the Courts in Tanzania. The dispute involves a claim for damages in excess of half a billion US dollars, and it has connections with the biggest corruption scandals to have hit Tanzania. 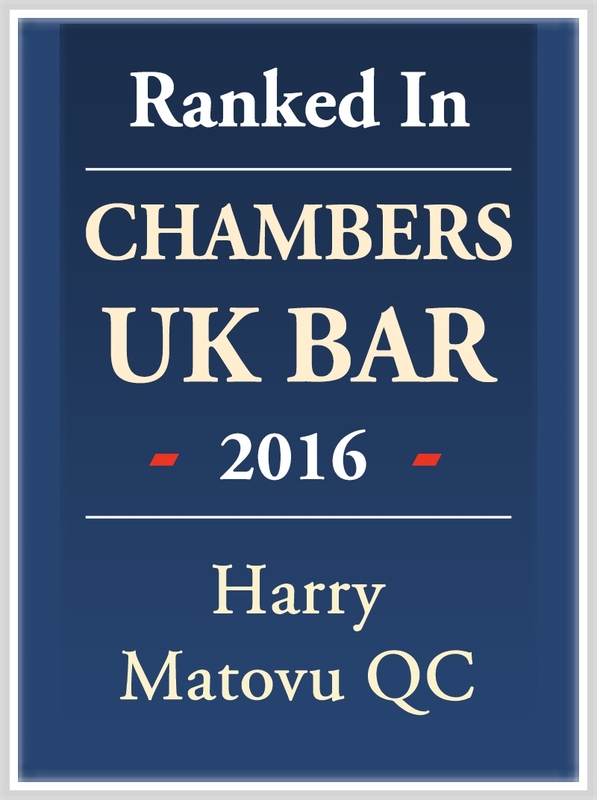 Harry Matovu has appeared in all the civil courts in England and Wales from the Supreme Court downwards, including the Commercial Court and the Queen's Bench and Chancery Division of the High Court and the Administrative Court. He is also regularly instructed in major international and domestic commercial arbitrations, and he accepts appointments as an arbitrator under Bermuda Form, ARIAS, LCIA, ICC, UNCITRAL Rules, as well as ad hoc appointments. He has lectured widely on international arbitration, and in particular disputes relating to Africa. Harry Matovu has detailed knowledge of the oil and gas exploration business; of liquefied natural gas (LNG) trading and shipping; and of the financing and valuation of oil and gas assets and businesses using sophisticated valuation methodologies such as discounted cashflow using discount rates based on the weighted average cost of capital. He was nominated for Silk (QC) of the Year (Projects and Energy) in the Legal 500 Awards 2014. Excalibur Ventures LLC v Texas Keystone Inc  EWHC 2767 (Comm),  EWHC 1624 (Comm) – Harry has recently been involved in a very substantial and high-profile action concerning oil exploration in Iraqi Kurdistan, which culminated in a 5-month trial in the Commercial Court. This was one of the longest-running trials in the Commercial Court in recent times, involving a claim for US$1.6 billion, and it resulted in an outright victory for his clients on all points. It was listed by The Lawyer magazine as one of the top 20 cases for 2012.
corporate finance, including in particular processes and issues for oil companies in fundraising through private equity, via merchant banks and investment banks, and on public exchanges such as AIM in London and the TSXV in Toronto. In addition, the case requires an understanding of the procedural law of Tanzania. In this connection, Harry has been granted special rights of audience by the Chief Justice of Tanzania to appear before the High Court and Court of Appeal of Tanzania. He has argued and led the case on behalf of his client at trial in the High Court, and in ongoing proceedings in the Court of Appeal of Tanzania on an important revision application. the actions of the Indonesian Legislature and Executive, and their implications for force majeure and contract frustration. In addition, the case requires an understanding of the procedural law of the Court of Appeal of Tanzania. Harry is familiar with this, as explained below (in connection with the VIP Engineering case). Harry Matovu has a substantial insurance/reinsurance practice, in which he has acted in numerous cases for and against insurers and insureds, reinsurers and brokers across almost all classes of business in the London Market. His cases have included major litigation and arbitrations in England and Bermuda, including the Lloyd's Litigation in the 1990s; various international disputes arising out of the US personal accident spiral; and international disputes involving energy insurance, construction all risks business, professional indemnity insurance, bankers' blanket bond business, credit insurance, aviation insurance, reinsurance of US casualty business and reinsurance of life business. Reported insurance/reinsurance cases include Berriman v Rose Thomson Young (Underwriting) Ltd. LRLR 426 (Lloyd’s Litigation arising out of the LMX Spiral); Charterhouse Development (France) Ltd v Sharp  Lloyds Rep IR 266 (bankers’ blanket bond and professional indemnity insurance claim); FIGRE Ltd v Mander  Lloyds Rep IR 193 (late payment of premium); Bank of Scotland v Euclidian (No.1) Ltd  EWHC 1732 (Comm) (claim arising out of failure of a major ATE insurance scheme); Temple Legal Protection Ltd v QBE Insurance (Europe) Limited  EWHC 843 (Comm),  EWCA Civ 453 (dispute in relation to a binding authority for an ATE insurance scheme); and IRB Brasil Resseguros SA v CX Reinsurance Co Ltd  Ll. Rep. IR 560 (coverage dispute in relation to reinsurance of US casualty business). asset-tracing remedies involving companies and assets in offshore jurisdictions such as the BVI, Cayman Islands, Cyprus etc. Recent cases in this area include a successful challenge to jurisdiction and a worldwide freezing order in a billion-dollar claim by a Kazakh bank which alleged a fraudulent conspiracy against its former chairman and shareholders (Alliance Bank JSC v Aquanta Corporation  EWCA Civ 1588,  1 All E.R. (Comm) 819 (Court of Appeal);  EWHC 3281 (Comm);  1 Lloyd's Rep. 181 (Burton J); a successful High Court action on behalf of a leading pharmaceutical company against a senior manager and several offshore Panamanian companies with Swiss bank accounts (AAH Pharmaceuticals Ltd v Birdi  EWHC 1625 (QB); a successful High Court action by financial services companies in UK and Ireland against a fraudulent former adviser and chief operating officer successful applications for freezing injunctions and search and seizure orders against the administrators of a major ATE insurance scheme (Aeropay Ltd v Bentolila  EWHC 3057 (QB)); and successful applications for freezing injunctions and search and seizure orders against the administrators of a major ATE insurance scheme. More recently, Harry has recently acted successfully for the manager of an offshore investment fund, who was facing allegations of fraud in a High Court action by a disgruntled prospective investor in relation to a UK property investment scheme. The case settled advantageously this year. VIP Engineering & Marketing Ltd v Standard Chartered Bank and Others – Harry is currently engaged in a long-running and very substantial international energy dispute before the Courts of Tanzania (see above under Power). The case, which raises allegations of fraud and conspiracy, and involves a claim in excess of half a billion US dollars, has connections with one of the biggest corruption scandals to have hit Tanzania. The trial commenced in February 2016, and the matter is ongoing before the High Court and the Court of Appeal of Tanzania (see above under the heading, ‘Power’). Harry Matovu has extensive experience of litigation and advisory work in relation to finance, having acted for several of the leading lenders and providers of business finance. His work has covered corporate finance and other City matters, including acting for a leading investment bank in relation to a DTI Inquiry following a major UK corporate collapse; and advising on split capital investment trusts. He has acted for both purchasers and sellers in disputes arising out of share purchase agreements, including warranty and ‘earn-out' claims. He has recently led a successful multi-million pound action for damages against sellers and insurers in a share purchase dispute, which confirmed important principles for the assessment of damages in such cases (Ageas (UK) Ltd. v Kwik-Fit (GB) Ltd.  EWHC 2178 (QB)). His practice also includes advice and advocacy in relation to credit insurance issues and disputes. 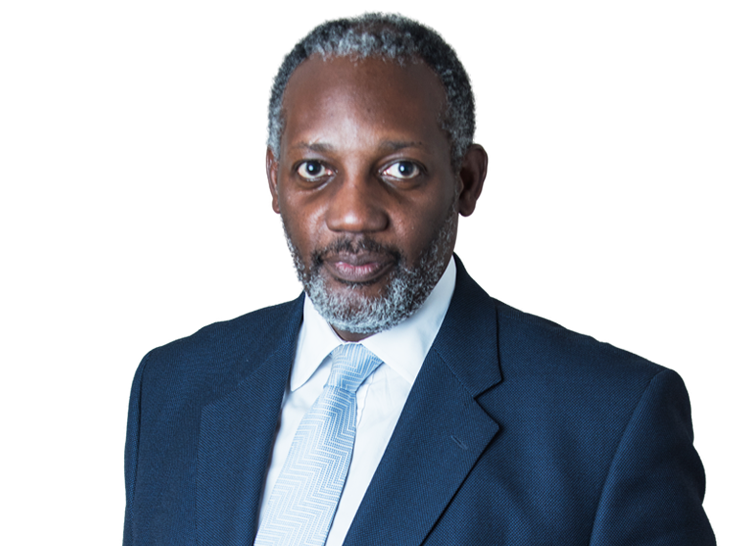 Harry Matovu has recently advised and acted successfully for defendants to a billion-dollar fraud claim brought by a major Kazakh retail bank (Alliance Bank JSC v Aquanta Corporation  EWCA Civ 1588,  1 All E.R. (Comm) 819 (Court of Appeal);  EWHC 3281 (Comm);  1 Lloyd's Rep. 181 (Burton J). He has also acted on behalf of a Swiss claimant investment fund in the successful resolution of a substantial dispute against a leading global investment bank arising out of a longevity swap agreement. Harry Matovu has a detailed knowledge of complex financial instruments and cross-border jurisdictional issues, and he lectures and advises on hedge funds, private equity funds and the Alternative Investment Fund Managers Directive (AIFMD). He has recently advised on passporting issues in relation to offshore funds under the AIFMD, and he has successfully acted for the manager of an offshore fund in relation to a claim arising out of a UK property investment scheme. International commercial arbitration is a significant part of Harry Matovu’s practice, and he accepts appointments as an arbitrator and as counsel. Harry is a member of the ICC and the LCIA. Arbitrations in which Harry has been involved as counsel include several multi-million-dollar disputes in Bermuda and England arising out of the US personal accident reinsurance spiral, which raised issues of fraud, non-disclosure, misrepresentation and coverage; a long-running dispute concerning a major legal expenses insurance business, which led to a favourable award that was upheld on appeal to the English Commercial Court; the successful defence of a major reinsurance claim by a foreign state insurance company against Lloyd's reinsurers, which raised complex issues of public and private international law; and the successful defence of a US$300 million political risk insurance claim concerning mining interests in Indonesia (see above under Mining Resources). Harry’s court cases arising out of arbitration disputes have a similarly broad spread. They include a successful application to the English Commercial Court for a rare anti-arbitration injunction to restrain a foreign arbitration (Excalibur Ventures LLC v Texas Keystone Inc  EWHC 1624 (Comm),  1 All E.R. (Comm) 933); successfully upholding a major insurance arbitration award on appeal to the English Commercial Court (IRB Brasil Resseguros SA v CX Reinsurance Co Ltd  EWHC 974 (Comm),  Lloyd's Rep. IR 560); and a rare successful application to the English Commercial Court for the removal of an arbitrator on grounds of apparent bias (Caisse Nationale de Prévoyance v Croft (2009)). Harry has been nominated and appointed as arbitrator (including Presiding Arbitrator) in several major international commercial arbitrations under ICC, LCIA and AFSA (Arbitration Foundation of Southern Africa) Rules. The nominations and appointments in the last 12 months have concerned disputes involving parties in a wide number of jurisdictions, including Nigeria, Tanzania, Kenya, Mauritius, Mozambique, Panama and the British Virgin Islands. Tribunal Bias in African Arbitrations, Paper delivered at the 1st ICC Africa Regional Arbitration Conference, Lagos 19-21 June 2016; published in European International Arbitration Review, Vol. 5:1, 31-51. Harry Matovu has considerable experience of administrative law and the workings of Government, having served as Deputy Counsel to the long-running BSE Inquiry (1998-2000). More recently, he was instructed by Kent County Council as Leading Counsel in a high-profile and successful judicial review of the Government's decision to stop the current scheme for funding building projects for secondary schools in England. This was listed as one of the top 20 cases for 2011 by The Lawyer magazine – Kent County Council v Secretary of State for Education  EWHC 217 (Admin). Harry Matovu has been involved in major cases raising substantial issues of public international law. In particular, he appeared as Junior Counsel for the President of Equatorial Guinea (led by Sir Sydney Kentridge QC) in a high-profile conspiracy claim arising out of an attempted coup d'etat alleged to involve English conspirators, which proceeded through the High Court and Court of Appeal to the House of Lords. The appeal raised issues about the justiciability in the English courts of a claim in conspiracy against the alleged perpetrators of the attempted coup. Given the importance of the issues raised, the appeal was heard by a panel of nine Law Lords. However, the action was settled before Judgment. This was listed by The Lawyer magazine as one of the top 20 cases for 2006, 2007 and 2008 – Mbasogo v Logo Ltd (2008) House of Lords;  EWCA Civ 1370 (Court of Appeal);  UKPC 7 (Privy Council);  EWHC 2034 (Davis J). Harry has also acted on behalf of a foreign state insurance company in arbitral proceedings concerning a reinsurance dispute which raised issues of state immunity and the justiciability of allegations about state policy and the management of the company. The reinsurers settled the claim and the arbitration shortly after an application to strike out their case. Harry is currently advising a major international organisation in relation to a complex and high-profile State Treaty dispute. Harry Matovu has experience in aviation matters, including aviation insurance, political risk and US sanctions law, and other matters such as advising on issues arising out of extreme weather conditions and the application of force majeure provisions. He is also experienced and regularly involved in jurisdictional disputes. Ageas (UK) Ltd v Kwik-Fit (GB) Ltd and AIG Europe Ltd  EWHC 2178 (QB) – Leading Counsel for successful Claimant in multi-million pound claim for damages for breaches of warranty in a share sale agreement. The case raised important issues as to the date and basis of assessment of damages in such cases. Excalibur Ventures LLC v Texas Keystone Inc  EWHC 2767 (Comm) - Second Leading Counsel for Defendants in ongoing billion-dollar dispute concerning substantial oil concessions in Iraqi Kurdistan, listed by The Lawyer magazine as one of the 20 leading cases of 2012. 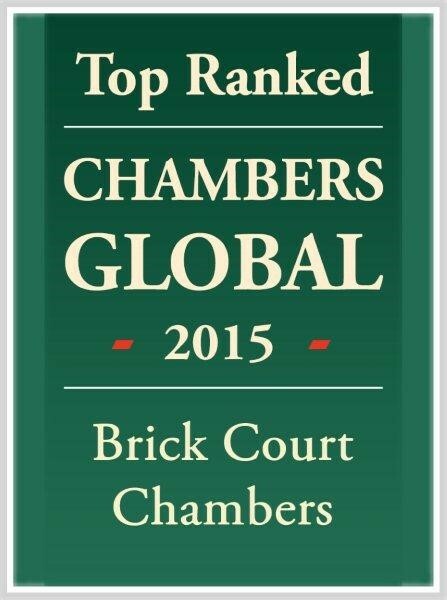 Included successful application for an injunction to restrain foreign arbitration proceedings  EWHC 1624 (Comm). Alliance Bank JSC v Aquanta Corporation  EWCA Civ 1588  1 All E.R. (Comm) 819 (Court of Appeal);  EWHC 3281 (Comm);  1 Lloyd's Rep. 181 (Burton J) - Leading Counsel for principal co-defendants in a billion-dollar fraud claim by a major Kazakh bank against its former chairman, directors and shareholders, in which massive worldwide freezing orders were obtained. The Defendants successfully challenged the jurisdiction of the English Court, both at first instance and on appeal. The case raised important issues regarding jurisdiction and subrogation. Kent County Council v Secretary of State for Education  EWHC 217 (Admin) - Leading Counsel for claimant local authority in a high-profile and successful judicial review of the Government's decision to stop the current scheme for funding building projects for secondary schools in England, listed by The Lawyer magazine as one of the 20 leading cases of 2011. PK Airfinance US Inc. v Chartis Insurance UK Ltd (2009-2010) - Junior Counsel for the claimant finance house in multi-million dollar aviation insurance case concerning the removal of 2 Boeing 747 aircraft to Iran. The dispute raised important issues concerning the law on total loss, the liability of finance parties for non-disclosure by the aircraft owner/lessor and the construction and application of the insurance market's AVN67B Endorsement. The case settled shortly before trial. Mbasogo v Logo Ltd (2008) House of Lords;  EWCA Civ 1370 (Court of Appeal);  UKPC 7 (Privy Council);  EWHC 2034 (Davis J). First Junior for the Claimants (led by Sir Sydney Kentridge QC). This was a ground-breaking and high-profile conspiracy claim arising out of an attempted coup d'etat against the Government of Equatorial Guinea, which proceeded to an appeal before a panel of nine Law Lords. The case involved important and novel issues of international law and the law of conspiracy. It was settled prior to Judgment in the House of Lords. It was listed by The Lawyer magazine as one of the top cases of 2006, 2007 and 2008. IRB Brasil Resseguros SA v CX Reinsurance Co Ltd  Ll. Rep. IR 560 - Counsel for successful Claimant in dispute concerning application of double-proviso settlements clause in casualty excess of loss reinsurance contracts involving claims arising out of settlement of major US class actions. Nirah Holdings Ltd v British Agricultural Services Ltd  EWHC 2282 (Comm) - Counsel for successful Claimant in Commercial Court dispute concerning purchase of land for £375 million major UK visitor attraction and science research park. Temple Legal Protection Ltd v QBE Insurance (Europe) Limited  EWHC 843 (Comm),  EWCA Civ 453 - Junior counsel in an arbitration and appeal to the Commercial Court and Court of Appeal in a dispute concerning the rights and obligations of insurers and their agents in relation to the run-off of a binding authority agreement. Masri v Consolidated Contractors International Company SAL  EWCH 2492 (Comm) - Application on behalf of judgment creditor for the appointment of a receiver over worldwide assets of a judgment debtor. A significant development of the jurisdiction of the Court in this area. Bank of Scotland v Euclidian (No.1) Ltd  EWHC 1732 (Comm) - Junior counsel in a major and long-running Commercial Court dispute concerning the operation of a failed multi-million pound after-the-event litigation insurance scheme. Settled in the Court of Appeal. Yugraneft v Abramovich and Others (2008) - Multi-million dollar conspiracy claim in the Commercial Court concerning major Russian oil company. Government of Iran v Barakat Gallery Ltd (2008 - 2010) - High Court dispute concerning claim of a foreign sovereign state to ownership and return of rare antiquities of importance to national cultural heritage. Lion Apparel Ltd v Firebuy Ltd (2008) - First Junior for the Claimants in a multi-million pound High Court dispute relating to a major Government public procurement project. MMR/MR Vaccine Litigation (2001-2006) - Junior counsel for a well-known pharmaceutical company in long-running and high-profile litigation brought by parents of children with autistic spectrum and other disorders against manufacturers of the MMR vaccine, which was alleged to have caused the disorders. The case against the manufacturers collapsed following service of a substantial volume of medical and scientific expert evidence from 60 experts across many disciplines. BSE Inquiry (1998-2000) - Deputy Counsel to the public inquiry chaired by Lord Phillips of Worth Matravers to establish and review the history of the emergence and identification of BSE and new variant CJD in the United Kingdom, and of the action taken in response to it up to 20 March 1996; and to reach conclusions on the adequacy of that response, taking into account the state of knowledge at the time. This wide-ranging inquiry involved (amongst other things) detailed investigation of the actions over 10 years of Government at the highest levels and covered several major Whitehall Departments; detailed investigation and analysis of the relevant scientific, medical and veterinary theories and knowledge, and of the organisation of scientific, medical and veterinary research in the UK; and detailed investigation of industry processes, action and controls within the farming, food, retail and waste industries. FIGRE Ltd v Mander  Lloyds Rep IR 193 - Junior counsel in a reinsurance dispute concerning late tender of premium. Charterhouse Development (France) Ltd v Sharp  Lloyds Rep IR 266 - Junior counsel for Defendant brokers in an insurance dispute concerning coverage issues and brokers' negligence in relation to bankers' blanket bond and professional indemnity insurance for a private equity house. Berriman v Rose Thomson Young (Underwriting) Ltd.  LRLR 426 – Junior Counsel for Defendant Lloyd’s Managing Agent in major claim by Lloyd’s Names arising out of the LMX Spiral. Trustee, The Personal Support Unit, an independent charity providing advice and support to litigants in person and members of the public attending court.